Multi-star hotels have a well-deserved reputation for pampering guests, offering numerous perks and all sorts of luxuries. But many of these come at an environmental cost. While some pricey hotels have spurned the concept of greening, claiming that guests don’t want to give up anything during a stay at a deluxe hotel, others embrace it, discovering that guests have responded positively—as has their bottom line. The sins of hotels are manifold. Changing bed and bath linens daily for hundreds of rooms and washing them uses resources and produces detergent-laced water that has to be subsequently treated or ends up in local waterways—or in the case of Midwest hotels, as far away as the Gulf of Mexico. While plenty of hotels no longer launder room linens every day (if they actually follow the practice, since in my experience even if you follow the prescribed procedure for reusing bath linens, housekeeping staff usually wash them, anyway), leading hotels have realized that in order to be truly green, they need to do much more. Two hotels, the Hotel InterContinental on Chicago’s Magnificent Mile and the St. Julien in Boulder, Colorado, strive to be green leaders for the hotel industry and have found numerous other ways to be more earth-friendly. For starters, converting light bulbs to low energy using CFLs can save bundles of energy, while reducing utility costs. 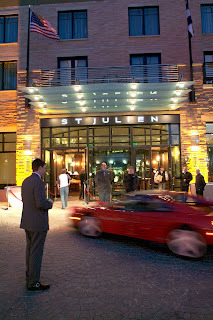 At the St. Julien, the replacement of the hotel’s bulbs resulted in a 48,000 kilowatt reduction in energy use. As of July, 2008, similar efforts at the InterContinental’s resulted in the savings of nearly 8,000 kilowatt hours of energy and water-saving efforts resulted in an 81,000 gallon reduction in water use. In addition to more predictable approaches such as less frequent bed linen changes and the use of recycled plastic, the hotels uses earth friendly paints and cleaners. And if that weren’t commendable enough, the St. Julien donates its worn or frayed bath and bed linens to nearby animal shelters—a green initiative that’s popular with animal-lovers and the eco-conscious, as well as many a Boulder area cat and dog. Meanwhile, the hotels’ restaurants have also pursued environmentally-friendly policies. The St. Julien’s restaurant works with local farmers and food artisans whenever possible, while the InterContinental’s wine, cheese and chocolate restaurant and tasting bar offers many award-winning local cheeses. In the end, green efforts are for naught if a stay at a deluxe hotel isn’t posh-feeling. These hotels, as well as others found here: http://www.lowimpactliving.com/providers/Travel---Green-Hotels/32, prove that it’s easy—and can feel posh—to be green.